Guest Profile tools allow you to customize and define the guest information you wish to obtain in the Guest Profile screen accessed by a reservation, check-in/folio, or People/Profile. Go to Manager/Setup > Hotel Control Files Setup > Guest Profile Tools. "Comp." is your current company such as 01. "ID" will be 00 unless you have parent/child profiles set up. This is rarely done. "Description " is the description matching the ID. 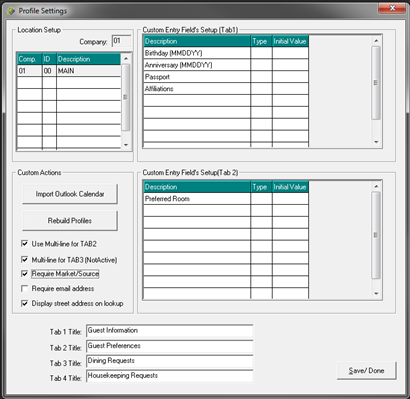 "Import Outlook Calendar" allows you optionally to import an Outlook calendar. The calendar events will display on the "Events" tab in the Guest Profile screen. These will show up for all guest profiles. You should set up a specific calendar in Outlook and not use your default calendar showing your doctor appointments, sister's birthday, etc. Once you have created the calendar, use Outlook's Export function to export the Outlook data into a Windows Comma Delimited file. Refer to Outlook's Help if you do not know how. Name the file EXECCAL.CSV and move it to the ExecuTech hotel folder. It will probably be in your My Documents - you can use your Windows "Search" feature if you cannot find it. Once EXECCAL.CSV is in your ExecuTech hotel folder, log onto Execu/Suite and go to Manager/Setup > Hotel Control Files setup > Guest Profile Tools. Click the "Import Outlook Calendar" button. At the prompt click Yes if you have done as instructed. Only do this once. You will not get confirmation. You can view a profile's Events tab to verify that the calendar information imported. "Rebuild Profiles" should not be clicked unless advised by Execu/Tech. "Use Multi-line for TAB2" if clicked will display a "free form" field in the Tab 2 information section of the Guest Profile screen. Unchecked will display a list of custom entry fields. "Multi-line for TAB3 (NotActive)" is inactive. "Require Market/Segment" if checked will require a market segment to be selected for each profile. 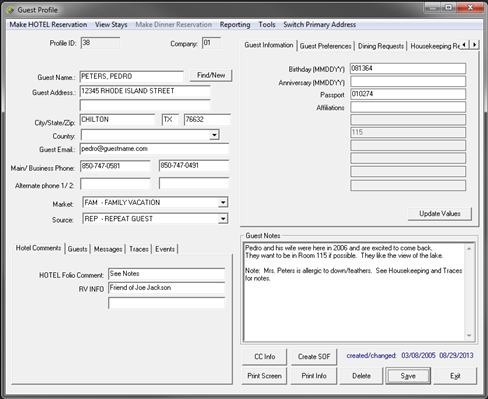 If unchecked, the profile may be saved without a market segment selected. NOTE: A profile market segment may be different from a reservation or folio profile although they typically are the same. A market segment code is required for all reservations and folios. A profile source of business may be different from a reservation or folio profile although they typically are the same. A source of business code should be required for all reservations and folios. "Display street address on look-up" if checked will display the guest's street address rather than the city/state on a profile look-up list. "Custom Entry Field's Setup (Tab1)" allows you to specify the information to obtain in Tab 1 for each guest. Examples: Birthday, Car License Plate, Affiliation. Up to ten custom fields are allowed. Tab 1 is always on top and visible. "Description" text will display on the Guest Profile screen in the Tab 1 section. "Type" is no longer used and may be left blank. "Initial Value" is no longer used and may be left blank. "Custom Entry Field's Setup (Tab2)" allows you to specify the information to obtain in Tab 2 for each guest. Examples: Preferred Room, Allergies. Up to ten custom fields are allowed. "Description" text will display on the Guest Profile screen in the Tab 2 section. "Value" is no longer used and may be left blank. "Tab 1 Title" changes the title of the tab. Default title is "Guest Information". "Tab 2 Title" changes the title of the tab. Default title is "Guest Preferences". "Tab 3 Title" changes the title of the tab. Default title is "Dining Preferences". "Tab 4 Title" changes the title of the tab. Default title is "Housekeeping". Note that each of these tabs may selected to print on the Guest Profile Traces/ Preferences Report from the Front Desk menu. Tab 1 and Tab 2 information can optionally print on the Arrival/Departure Report from the Front Desk menu. Click "Save/ Done" or press Alt+S to save your changes. - The Guest Profile screen is where users enter information about the guest. The screen reflects the parameters that you set up in Guest Profile Tools.